David Schmoeller is the director of such genre pleasures as Tourist Trap (1979), Crawlspace (1986), Puppet Master (1989) and Netherworld (1992), among others. He is currently an Associate Professor in Film at the University of Nevada Las Vegas. He continues to write and direct movies, recently producing the indie hit Thor at the Bus Stop available on DVD at thoratthebusstop.com. He has also completed a screenplay called Blue Tears, about mannequins coming to life in a shopping mall, of which he says: "I am seeking funding. If someone can write a check, let’s make a movie!" For more information about David and his work, visit www.davidschmoeller.com. I've had an interesting, long relationship with John Carpenter’s magnum opus Halloween (1978). In addition to my deep appreciation for the film, I have these various, incidental connections between my first feature, Tourist Trap, and Carpenter’s third picture. 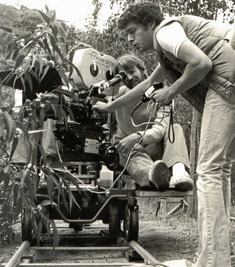 Most significantly, both films were released domestically by Irwin Yablan’s Compass International, a small indie distributor at the time (1978-1979). Even though Tourist Trap was shot first, Halloween was released first (more about this later). I was just a few years out of film school (University of Texas at Austin) and relatively new to Los Angeles. With Tobe Hooper's Texas Chainsaw Massacre as a model, my partner Larry Carroll (who had edited Chainsaw) and I wrote a feature version of my UT Thesis film The Spider Will Kill You (available on davidschmoeller.com) and attached ourselves to produce and direct the project. We gave the script to three producers: Sam Arkoff, a major B-movie distributor of the day; Bruce Cohn Curtis; and Charles Band. Larry was working for Charlie as an editor. We never heard back from Sam Arkoff. Bruce Cohn Curtis made a ridiculous offer: “David, you can be the AD, Larry, you can be a PA, and I will pay you almost nothing for the screenplay.” We really didn’t know how to react to such a lame offer, so we asked him to let us “think about it” - and we also let him know that we had the script out to other producers. We never got back to him, if I remember correctly. In the meantime, Charles Band had read the script and liked it - and in a meeting with us, said to me: “How do I know you can direct?” I showed him The Spider Will Kill You, which was a Student Oscar finalist, losing to Robert Zemeckis’ thesis film, but it showed that I could bring mannequins alive - on film. Charlie saw the short and was convinced I could direct and made us a deal. We immediately went into pre-production. At some point during this period, we received a call from another director-friend, who knew we were in pre-production on Tourist Trap, and informed us that he had heard that John Carpenter was in Hawaii rewriting Tourist Trap for Bruce Cohn Curtis. It was to be a film Carpenter would direct. We suggested our director friend tell his source that we were just a few weeks away from starting principal photography. I have never met John Carpenter and I have never talked to John Carpenter, so, I have no idea if this information was correct - or just some kind of punking or an urban myth. 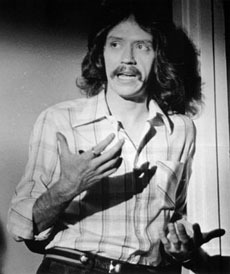 We still had no idea who John Carpenter was - he really wasn’t on the Hollywood map yet - because he hadn’t made Halloween at that point. When we were in post-production on Tourist Trap, Charles Band ran out of money just about the time we were in picture-lock. We had no money for sound or music or any other post-work. We would come into work everyday - hoping “Charlie” would be able to raise the money to finish the film. One day, while we were sitting around (Larry was always fending off vendor calls trying to collect money owed - so, at least HE had a purpose), we saw an article in the Los Angeles Times Arts section about John Carpenter and producer Debra Hill and their film Halloween, which was to be distributed by Irwin Yablans. This was this first we knew that Yablans had another movie he was distributing around the same time as ours. It was a very good article. We were starting to worry. Charlie still did not have the money to finish our film and at some point, he sent us to the MGM sound effects library. The way the labs work in Hollywood, they own the negative until the bill is paid off. So, effectively, we had a charge account with MGM. Tourist Trap editor Ted Nicolau and I went into the old MGM sound labs and started building our sound effects for Tourist Trap. You would have to listen to all these 35mm magnetic sound rolls found in boxes. Very tedious, and very bad way to pick sound effects for your movie. But, in terms of trivia, Tourist Trap is filled with sound effects from all the great MGM movies, from the Morlocks creature sounds of The Time Machine to rifle gunshots from Gone with the Wind. We at least saw daylight at the end of the tunnel. We would finish our movie. Except for the music - which was still up in the air. At some point, Irwin Yablans came in and looked at the picture-lock of Tourist Trap. He would tell me later, when I was making my second film for him two years later, that he watched the picture-locks of Halloween and Tourist Trap at about the same time. He thought Tourist Trap was probably going to be the more successful film. All things considered, he thought Tourist Trap was different, more original in terms of subject matter. He felt Halloween was good, but it was just a familiar story about baby-sitter murders. John Carpenter composed this very simple, but very effective - electronic score for his movie. The very simplicity of his music was remarkably transformative. It profoundly changed the impact the movie had on the viewer. It was truly masterful. And, it made Halloween a masterpiece, and a landmark picture. We still didn’t have music for Tourist Trap. And Yablans had a really solid, completed Halloween - so, he set out to release that film first. I screen Halloween every summer in my UNLV Genre Studies class along with various interviews with Carpenter - and he will be the first one to say that its initial release was not the great success it ultimately became. But, at some point, Halloween caught fire and became a bonafide hit. A lot of careers were launched and a lot of fortunes were made. When Charlie was finally able to come up with the finishing money for Tourist Trap (well after the successful release of Halloween), through a fluke, we found our composer. The fluke was that Joe Dante had hired Pino Donaggio, the Italian composer of such great horror films as Don’t Look Now and Carrie to score his Roger Corman film Piranha. Pino was in town to spot the film, but Pino did not speak English and Joe did not speak Italian. At some point, Joe called me and because both Pino and I were fluent in Spanish, I interpreted as Joe and Pino spotted the film. During this time, I couldn’t pass up the opportunity. I asked Pino if he would consider doing the score for Tourist Trap. He watched the film and liked it – and agreed to do the score. Charlie made a deal for him to do an orchestral score in Italy - the price was $50,000 - one-sixth of our entire budget. The punch line: when we finished Tourist Trap and had a cast and crew screening - which was the first time Irwin Yablans had seen the finished version since the picture-lock - he stormed out of the screening, furious. He would not talk to me. I called him a number of times and he would not take my call. Finally, he scheduled a meeting with me. At that meeting, he told me I had “ruined” my movie with the music. He couldn’t explain it but…he was certain I had undermined my film with Pino’s orchestral score. Yablans had experienced Halloween in picture-lock without Carpenter’s score and then had experienced it WITH the transformative score - and saw how powerful that could be. Then he watched Tourist Trap - which he liked - but with an orchestral score. 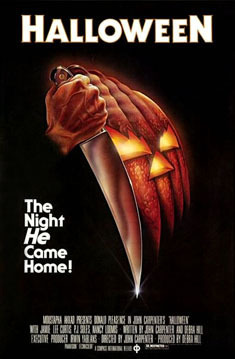 That made it a better movie...but did not have the same transformative effect that Carpenter’s score had on Halloween. 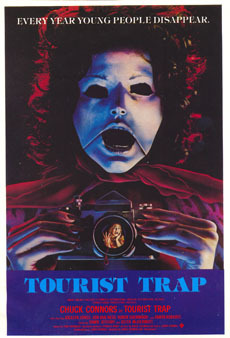 Pino’s music made Tourist Trap better - but it did not make it a “hit” picture like Carpenter’s score had made Halloween. So, Yablans was disappointed…and that disappointment led to a less than enthusiastic release of Tourist Trap. My own frustration was this: John Carpenter was the only individual on the planet who could write that score for his film. I am not a musician. So, I had to hire someone to do the music for my picture. Even if I had of known about John Carpenter’s magical scoring abilities, I’m SURE he would not have even considered the job offer. In fact, I’m sure he did not even know of his own magical composing powers until Halloween took off. So, while I understood Irwin Yablans’ frustration that lightning-in-a-bottle had not happened twice in a row, I really didn’t think it was fair that he did not appreciate the great work that Pino had done with the score of Tourist Trap. CODA - the final irony: when I was doing my second film, ironically, with Irwin Yablans, I got a call from the distributors of the soundtrack album of Tourist Trap - with whom I had become friendly because they were big fans of the work of Pino Donaggio. They asked me if I could ask Yablans to make a deal with them to release the Halloween soundtrack album. I made the deal and they gave me two points in the profits. Most soundtracks have a very short shelf-life - a few years at best. The Halloween soundtrack is still going, 32 years later. Very rare - but a real testament to the power of Carpenter’s simple score! In all of the interviews that I have seen with John Carpenter, he seems like a very cool guy. I’m really sorry I never met him (although I met Debra Hill several times). I hope, before I die, I get a chance to meet him. I would like to think we could be friends.